Projects Abroad’s Conservation Project in Peru recently received recognition for the work they have been doing at our base, the Taricaya Research Centre. The Conservation Project’s animal rescue centre is based deep in the heart of the Amazon Rainforest and has been recognised by the Peruvian government as the best and most effective of its kind in the country. Raul Bello, Head of the Rescue Centre at Taricaya, was invited to present our latest research and work at a primate conference in Iquitos from the 7th to the 10th of November. Other organisations, such as the IUCN and the World Wildlife Fund, were at the conference and had already heard of the work being done at Taricaya. The conference was centred on the primate species in Peru. 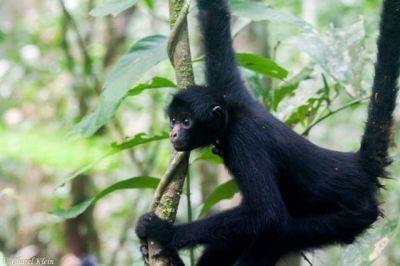 One of our many release programmes at Taricaya focuses on Black Spider Monkeys (Ateles chamek)and works to help this endangered species. Raul presented our work on Spider Monkeys dealing with our successful reintroductions, population numbers, plans for future releases and statistical models on how the wild populations will withstand when faced with naturally occurring threats. Our conclusions based on SCILAB software is that “….in the following years, if the population increases and the numbers of individuals remains high, it should be capable of resisting and recovering from unfavourable events”.